The annual ZAP (Zinfandel Advocates & Producers) Zinfandel Festival kicks off on the 27th in San Francisco. The Fort Mason Center a gorgeous location for this raucous and lively tasting–I’ve been a few times and walked away with purple teeth, rosy cheeks, and a new found enthusiasm for Zin. We haven’t decided if We’re going to make it to the festival this year. We’ve put something like 6,000 miles on my car in the last six weeks (including a delightful jaunt to Napa Valley this past weekend). We love the road trips, but I’m feeling a little road weary. And looking it too: both my car and my body could use a detail. It’s difficult not to pick favorites when tasting this way. Inevitably you pick the “winner of the group.” I found myself taking extra slurps of the Harris-Kratka. I enjoyed it’s brightness and zing. It wasn’t overloaded with syrupy fruit or earthiness, which can turn me off in Zins, but rather it was sleek and spicy. At the other end of the tasting spectrum was the Forchini which had wild, oily like texture and very meaty flavors. The Conte falls somewhere in between these two. It struck me as less complex and therefore maybe a little easier to drink (but not my favorite). There is lots of blackberry and blueberry fruit flavors in the Coffaro and a hint of spicy wood. These were present in Adel’s Vineyard, which I found more fresh and with hints chalky, cocoa powder. Ah, the nuances. This is what makes a vert/horiz/all-about-one producer/grape/vintage tasting so fun. Bottom-line: they were all delicious. 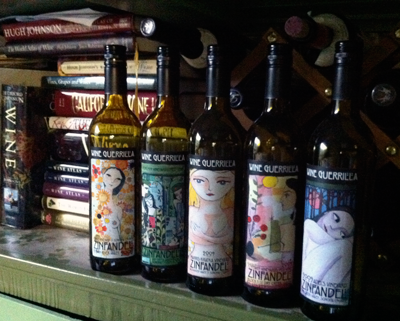 If you’re heading to ZAP, seek out Wine Guerrilla–and say “Hi” to Bruce from Us. And if you’re not, do like We did and have your own private festival. And don’t forget the two other Zinfandel tasting essentials: chocolate and teeth whiteners.